I’m fielding questions from Republicans who are very, very anxious to have an alternative to Dan Patrick, and they like what I tell them about Leticia Van de Putte. 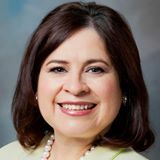 Having one her primary outright, Van de Putte has something of a golden opportunity right now to define herself and get her name out, while Dewhurst and Patrick keep up the Primary shenanigans. That could end up being a winning formula for her.